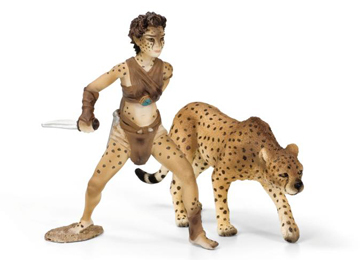 Schleich 70442 - Liassa, the cheetah woman, is beautiful, quiet and unbelievably fast. Liassa is a powerful heroine poised ready to pounce with a dagger in her left hand, paired with a cheetah companion that can run up to seventy five mph so no enemies can escape and equally no-one will be able to catch them. She is a friend of Umitok and acts as a messenger in Bayala.